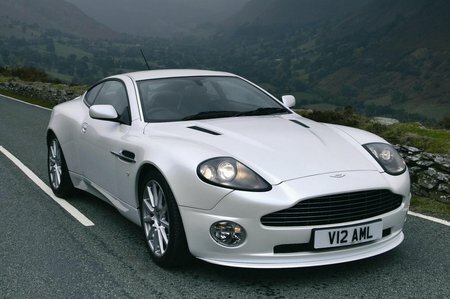 Used Aston Martin Vanquish Review - 2001-2007 | What Car? Which used Aston Martin Vanquish coupe should I buy? Do you go for the high-performance version or the even-higher-performance version? When the Aston Martin Vanquish was launched in 2001 – with a fanfare of James Bond publicity – it came with a 460bhp, 400lb ft V12 engine. With a 190mph top speed and 0-60mph in a mere 4.8sec, you would have thought that performance could not have got any better. The S version came along in 2004. It used the same glorious-sounding 5932cc V12 engine, but this time with an extra 60bhp, raising the output to 520bhp. Pulling power was up to 425lb ft, while the top speed increased to 200mph. Aston Martin managed to shave a little off the 0-60mph time, at just 4.6sec. Both models use the same racing-style paddle-shift gearbox and are reasonably well equipped. On the 'in for a penny, in for a pound' philosophy, we'd opt for the full-bore S.